For the last few weeks, the weather has been all a jumble. One day it’s 60 degrees and ☀️, the next 30 degrees and 🌬, the third 45 degrees and 🌧. And just like the weather, my creativity has been inconsistent. One day I’m on fire, the next day I’m hitting the snooze button. Could it be that the changing of the season is affecting my creativity? It’s too easy to blame something else for our lack of motivation. But creative types tend to be more sensitive to nature’s cycles and rhythms. We tend to internalize what happens around us—and this can affect how focused or creative we are. But is it all in our heads? Spring is a time of energy, the perfect moment to jump into a new project or breathe new life into a creative venture getting dusty on the shelf. In other words, we’re not shy about hitting the ground running. Summer brings a warmth that makes us more lethargic—and more prone to summer vacation. Between bouts of globetrotting, we crank out creativity for an ongoing project. Yet the long, hot days reminds us this is a marathon, not a sprint. Autumn is a time of harvest, so look at what you’ve created. Is it ready to be shown to the world? Does it need to hibernate? Or does it need to be reshaped? The visual collage of leaves outside puts creativity in perspective and we become more introspective. Winter feels like the end of the world, but really it’s time to rest. We’re tired after giving our energy (and creativity) throughout the last three seasons. Our creativity doesn’t sleep but thinks, strategizing ways to launch beautifully come spring. 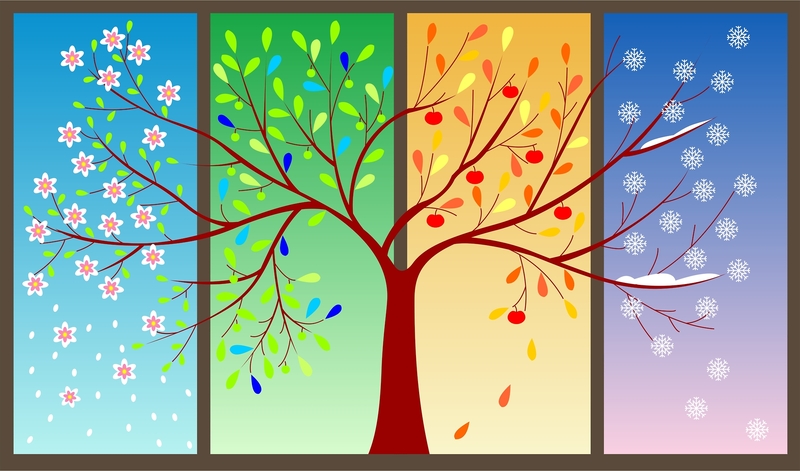 Is it the seasons that impact our creativity, or our perception of each season? According to a recent study, it’s not just in our imagination. Researchers found that our physical warmth affects how our brains process information. For example, when it’s warm, we’re more relationally creative and our creativity focuses on the relationship between people and objects. And when it’s cold, our abstract, “big picture” creativity takes center stage. Are we just accepting that winter means lack of motivation? Could it be that we let our views of spring, summer, fall and winter determine how much we get done? I’ll give you a personal example. When I was writing my full-length play, I spent the summer months brainstorming the plot, outlining the scenes and developing the characters. I wrote—and finished—the play during the cold winter months. I did not spend the summer writing the play. And I did not spend the winter thinking about the story. In fact, I did the complete opposite of what we’re told to achieve during those seasons. I found that when I was truly passionate about a creative project, it didn’t matter what season it was. I was too motivated to get it done despite the clouds or sunshine outside my window. What do you think? Do the seasons affect your creativity? Share why or why not in the comments section below.